By Staff Writer on December 2, 2009 . 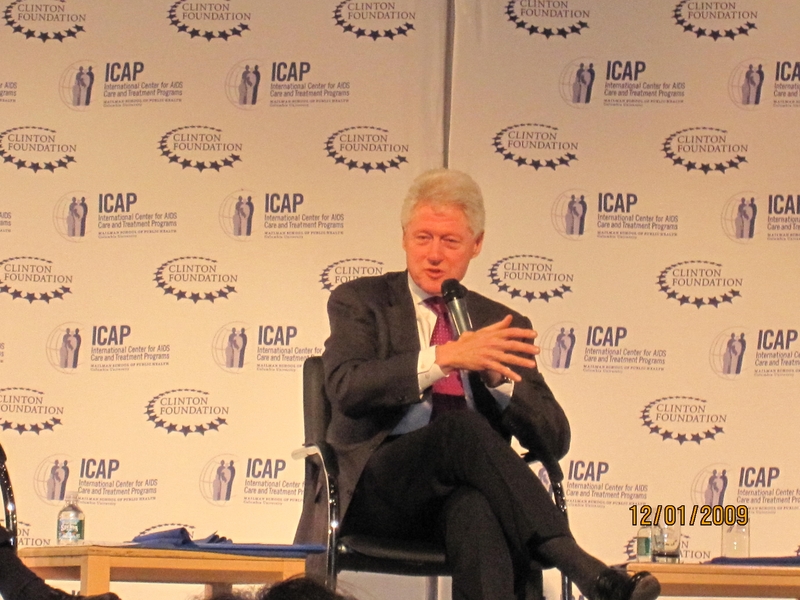 To commemorate World AIDS Day, Columbia University’s International Center for AIDS Care and Treatment Programs (ICAP) hosted an all-day symposium on “HIV Scale-Up and Global Health Systems,” featuring the star power of former President Bill Clinton. ICAP supports national HIV programs in 14 resource-limited countries in Africa and provides services to more than 350,000 people. The World AIDS Day program featured a multi-disciplinary cadre of speakers, including physicians and public health experts working in HIV, as well as maternal and reproductive health, legal scholars, health economists and activists. Much of the discussion was focused on the nexus between HIV programs and chronic care delivery and women’s health services, and the current and potential impact of HIV funding and infrastructure on broader health systems. The policy and political backdrop to the discussion was the Obama Administrations proposed expanded Global Health Initiative and the Administration’s announcement that the 5-year HIV treatment target would be 4 million individuals. This treatment target translates into an additional 1.6 million persons to be added to the treatment rolls over the next 5 years, far fewer than the 6 million person treatment target embraced by US advocates. 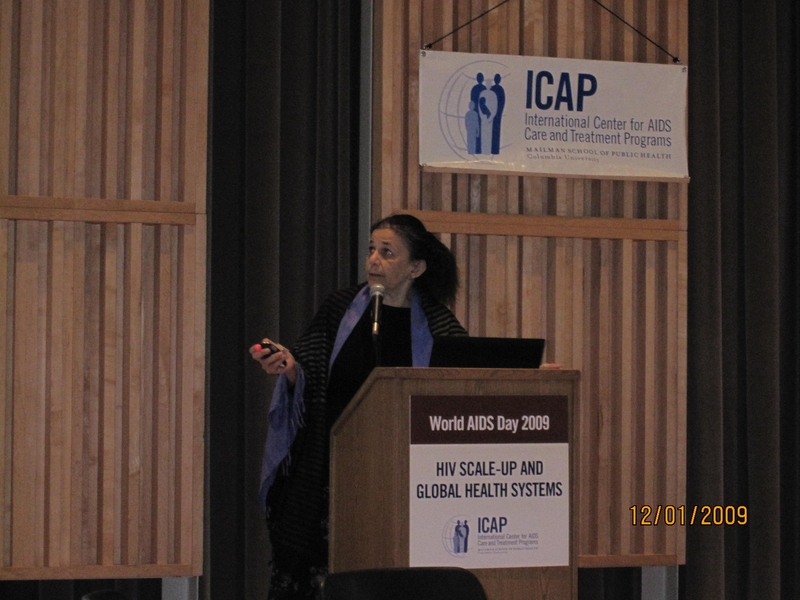 Wafaa El Sadr, MD, MPH, director of ICAP and a member of the Center for Global Health Policy’s Scientific Advisory Committee, discussed the potential for PEPFAR to play a transformative role in health care in developing countries, as the first large-scale chronic disease program in the developing world. There was much discussion about using the tools, strategies and lessons learned from PEPFAR to inform and strengthen the delivery of other health care, while using the power o f the AIDS civil society advocacy community to amplify the call for additional resources to address with other persistent health issues in developing world settings, most notably intractably high rates of maternal mortality. Health economists pointed out the limitations in evidence and data on which to make any firm conclusions about the overall impact of PEPFAR on health systems or to answer the question about whether in the absence of PEPFAR, resources would have been made available to deal with other health issues in poor countries. Many of the speakers also acknowledged the urgent need for operational research to determine how to effectively integrate HIV prevention, care and treatment with the delivery of other health services is urgent. President Clinton served on an afternoon panel moderated by Stephen Lewis, and the session had its lively moments. At one point, a loud and youthful-sounding voice from the audience challenged Clinton to advocate for full funding for PEPFAR with his wife Hillary Clinton, the current Secretary of State. While Clinton defended the Obama Administration, with its myriad challenges including a severe economic recession, he conceded that continuing scale up of HIV treatment in particular is critical, given the huge unmet need for lifesaving care and treatment. He noted that he would do his best “to squeeze blood from a turnip” and encouraged his audience to give the Administration credit for lifting the immigration and travel ban for HIV-infected individuals entering the U.S. and for appointing the able Eric Goosby to lead the U.S. global AIDS program. The final panel of the day featured former U.S. Global AIDS Coordinator Mark Dybul and long-time AIDS activist Gregg Gonsalves, both of whom expressed dismay about what appears to be a retreat of the Obama Administration from the goal of universal access to HIV treatment and prevention services. Dybul called for a transformation of the Global Fund to Fight AIDS, Tuberculosis and Malaria to a Global Fund for Health as a way to minimize advocacy competition among diseases, ensure a country-driven response to health, and fulfill a humanitarian imperative to treat a whole person. Gonsalves challenged what he called the “AIDS backlash,” including arguments in the halls of the White House and in academic journals that PEPFAR has undermined broader goals in health and development; that HIV treatment is too expensive and is not “cost-effective”, that AIDS programs are destroying health systems and promoting unnecessary deaths from simpler-to-treat-diseases and conditions such as childhood diarrhea. “AIDS has become the new bogeyman-deflected attention from the culpability of national governments in the North and the South for the longstanding crisis in health and development around the world,” Gonsalves said. All those who attended the symposium agreed that opportunities to discuss these issues across disciplines and diseases or health conditions were rare and valuable. There are many challenges ahead to secure adequate funding to continue HIV scale up, while also enhancing funding for other critical global health priorities and ensuring the provision of patient-centered health care to the world’s poorest people. This entry was posted in Uncategorized on December 2, 2009 .